The National Institute on Genealogical Research Alumni Association has issued a press release on the scholarship available for the 2013 institute. The scholarship is open to any experienced researcher employed in a paid or volunteer position in the services of the genealogical community. The deadline is early this year, December 15th, so if you are interested in the $500 scholarship apply right away. The National Institute on Genealogical Research Alumni Association (NIGRAA) announces the Richard S. Lackey Memorial Scholarship for 2013. This scholarship is awarded to an experienced researcher employed in a paid or volunteer position in the services of the genealogical community. The amount of the Scholarship is $500, which covers full tuition for the National Institute on Genealogical Research, attendance at the Alumni Association Dinner, and will partly defray hotel and/or meal costs. The winner will be notified no later than 15 February 2013. 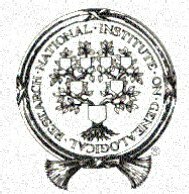 The scholarship winner will automatically be accepted for the National Institute on Genealogical Research (NIGR), to be held at the National Archives in Washington, D.C., from Monday, July 15 through Friday, July 19, 2013. NIGR is an intensive program offering on-site examination of federal records and is intended for experienced genealogical researchers. Note: an application to attend in 2013 must also be submitted to NIGR.